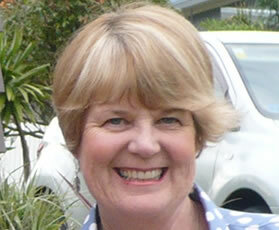 “I am an Aucklander, although I lived the first half of my life in the Waikato, where I trained as a teacher and singer. I moved to Auckland when my children were young. My family, teaching and singing were my main focus for most of the years I have been here, until health forced me to give up my singing performance involvement and I turned back to a creative outlet that I had a passion for – writing. At the moment I teach at an intermediate, and am studying for a Post Grad. Dip Museum Studies. It is this love of history that has drawn me to read a copy of my great-great-great grandfather’s diary who was one of the first pakeha settlers in TeUku, Raglan. His story, along with a teaching unit, based on James K. Baxter’s poems inspired me to write the poem, ” The Colonial” which I entered for this competition. It’s hard to believe that he and his wife left England for NZ “not wishing a soul goodbye, not even my dear loving mother”.